Mar 29, 2007 — And the award goes to ChaZack, created by Richard Lewis, Josh Graber, and Mathew Cherney. The winners of the Student Short Film competition were announced today by Yeshiva Universitys Center for the Jewish Future (CJF), which sponsored the festival, in which the winning producers, all Sy Syms seniors, received $2,000 toward the purchase of film equipment or Jewish books. The festival’s theme this year was “Who is Your Jewish Hero?” Over 2,500 people saw the films and cast votes for their favorite. 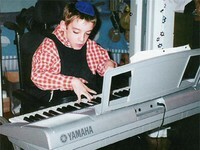 ChaZack is the story of Zack Pollack, who suffers from cerebral palsy. He has overcome his disabilities and serves as a role model and inspiration to all of those around him. To view the film click here. Using the new communications lab in Belfer Hall, some 30 undergraduate students created short films on the Jewish hero of their choice. A panel of three judges chose the top eight films—all five minutes long, or less—and the audience at the Schottenstein Cultural Center screening on March 21 narrowed the field to five. “By encouraging students to use the tools of modern media and draw on their personal creativity, we want to encourage their individual voices in building the Jewish future,” said Jordana Schoor, CJF’s director of special projects. The other contenders for the top prize were: Embracing the Dichotomy, produced by Chai Hecht and Shealtiel Weinberg; The Patriarch, produced by Ariel Saidian; Lchol Ish Yesh Shem: Every Person Has a Name, produced by Uri Westrich; and A Man of Ideals: The Story of Richard M. Joel, produced by Jonah Raskas.